How Much Will a Lawyer Cost? If you're a biker, chances are you'll get a new bike or ride with someone else who has a new motorcycle at some point during your life. Even if you're excited about a new ride, remember to go through the safety checklist to before taking it out on the road. Refer to the owner's manual for the bike's specs. Check all oil and fluid levels – too high or low can negatively affect your engine and affect the way the bike handles on the road. Check the tread on your tires. Don't wait for your next inspection…you'll want to have good tread to drive safely through showers and thunderstorms. Make sure that the rubber isn't drying out, cracking, or otherwise damaged. Finally, check the pressure in your tires – it can affect the way your bike handles. You should always check your headlights, brake lights, turn signals, and four-way flashers before riding any bike, including when you get a new one. Your lights are your way of being seen and communicating with other motorists. Check the bike's controls, and make sure there are no leaks or rust along the lines. The throttle is another part you should always check before riding any bike. The throttle should snap back when you let go, while the clutch should feel tight and smooth. When you check the brakes, test the front and rear brakes one at a time. Each should feel firm and hold the bike. Check the horn. Even if you're an experienced rider, you should be able to alert other drivers of where you are at any moment. After going through your safety checks, the best thing you can do is be extra cautious until you get familiar with the bike. Even similar models might throw off your center of gravity or feel different than you're used to. Driving defensively can help prevent a motorcycle accident, and wearing a helmet and proper riding gear can help protect you from injuries. 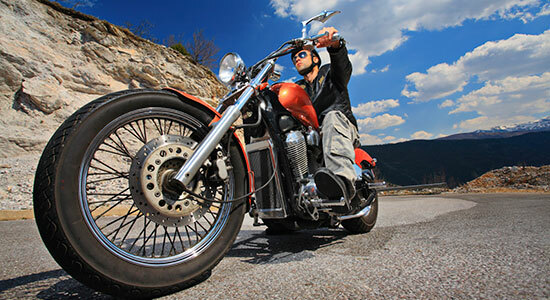 If you or someone you care about were injured in a motorcycle accident, you must act quickly. There are time limits to file a claim, and if you wait too long, evidence could disappear. Call us toll-free at 1-866-943-3427, or submit your information with the form at the top right of this webpage for a free consultation of your claim. Phones answer 24/7 – get started today.